Welcome back to “From The Tapers’ Section,” Part 2B. @wforwumbo here with another matrix of a 2017 show: Red Velvet night, 7/23/17. Of all Baker’s Dozen shows to remaster, I curate 7/23/17 here for a number of reasons - the biggest of which is that it’s the Baker’s Dozen show I feel is the most under-discussed given the material contained within the show. It is the first show of the year that appreciates how special 2017 would eventually become; walking out of the venue that evening, this show destroyed my expectations for what Phish is capable of performing. To my ear, it is a precursor to what would come the next two nights of the run (though hindsight is always 20/20). Red Velvet night is also the first show that presents the 2017 jamming style in a fully-realized form, both in the “How Many People Are You” and “Wolfman’s Brother” > “Twist” > “Waves”; but more on that shortly. We kick off this show with some very Phish-y antics in the form of the Velvet Underground’s “Sunday Morning.” Friar Fishman anoints us in the Church of Phish while serenading us with his un-dulcet vocals. We get a high-energy one-two punch of “Axilla” and “Your Pet Cat,” with “Back on the Train” following close behind to mellow us out. Then we get “How Many People Are You,” and I want to stop and discuss this jam for just a moment as I feel it holds greater importance than people give it credit for. Around 4:35, it seems the song begins to wind down, but the band clearly has other plans; ten seconds later it becomes obvious we’re going to enter a thick groove-heavy jam in C mixolydian coasting on the back of Fish’s ride and Page’s rolling chords. Trey leads us into the passage with some light trills as the band stays put and explores space and energy, seeing what they can do with what’s presented in front of them. It does take time for the band to find its footing in this space, but at 6:40, Trey finds the lead tone he wants and starts to soar, allowing the groove underneath him to become the runway as the band accumulates velocity. At 6:53, Mike begins treating us to some meditative chanting with the rest of the band following close behind, marking true entry into the peak. Page and Trey are playing up the tension using the major fourth and second to create suspension, resolving cleanly each time to various combinations of the root, third, and fifth. At 7:05, the music takes over, allowing us to collectively achieve liftoff as Trey hits the reverse reverb and a few delays for good measure, allowing his tones to hang in the air around the audience like steps for us to ascend the heavens. And for a brief moment, we have found the answers to the universe - in the first set, no less! At 8:01 Fishman brings us back into “How Many People Are You” proper, a bit abruptly though I’m not sure I’ll complain as it allows the band to keep their fuel tanks fully stocked for the numerous peaks we reach later in the show. While this “How Many People Are You” jam isn’t the first Set 1 jam of the tour to truly spread its wings (see 7/14 “Everything’s Right,” 7/19 “Prince Caspian,” 7/21 “Timber,” 7/22 “Moma” > “Breath and Burning”), it is the first fully-evolved first set jam that is indicative of a novel groove jam style I want to start discussing. The jams listed here - particularly that 7/14/17 “Everything’s Right” - are effectively a road map culminating in this “How Many People Are You.” This particular jam is the first time where everything clicks completely. Paying homage to and evolving from cow funk, the band finds a new way to develop a singular groove and creates something fresh from the depths of improvisation they are capable of. There is a slick and steady groove that gradually builds in energy, with no hurry; the patience is astounding. On top of that, Page and Trey would soon develop the style further with filter-based effects and synthesis-heavy tones, seeing full realization later on in this show. But I really can’t stress highly enough that I feel this “How Many People Are You” is the first true demonstration of what 2017 Set 1 Phish is all about. Continuing on the threads of the “How Many People Are You” from set 1, this “Wolfman’s Brother” goes around the dark side of the moon and back. Up front, the groove kicks off on the back of Trey’s Moog MF-104M Analog Delay at 3:59 as Page builds tension on the minor 7th (Ab/Eb). The band follows a somewhat predictable high-energy trajectory up to a classic 3.0-style “Wolfman’s” peak at around 8:05; while there’s plenty to write about in that 4-minute span, it’s only a small taste of what’s to follow. At 8:55 the band plays around with moving to Ab, but at 9:08 Trey starts playing in Db mixolydian and layers on some heavy loops, which Page follows on the Clavinet and Mike following shortly behind. Fishman drops out altogether for a little bit starting at 10:18 and we explore the frothy soup of happy, simply floating in the ether of Trey’s loops. At 10:39 we are given a massive rumble of bass, possibly from Mike playing with what to my ear sounds like the shimmer algorithm on his Eventide Space. Around 11:45, Trey finally adds some gain to his tone allowing notes to feed back and dominate the aura underneath the bed of loops, finally giving us a melody to latch on to at 12:09; Fishman swells us in on his cymbals, giving us rhythm and a massive Type II peak commences. 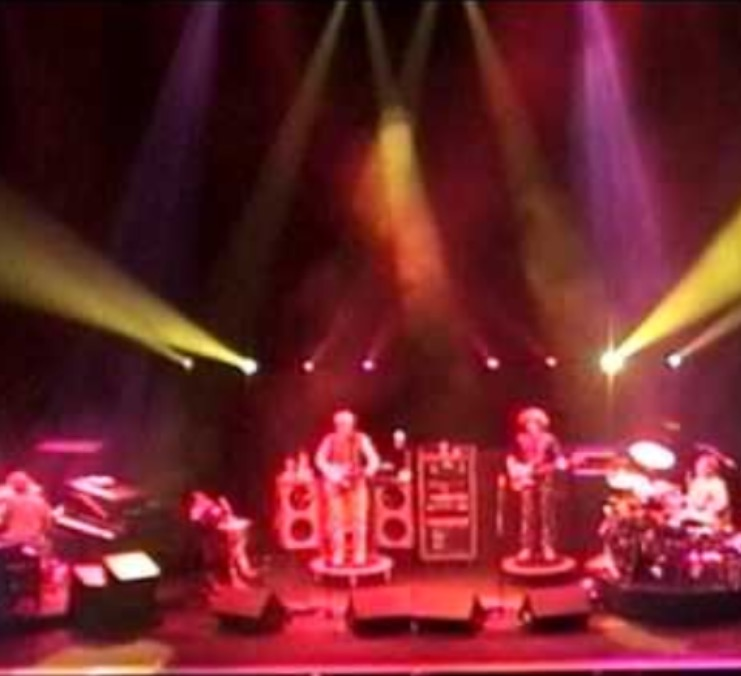 13:10 signals a bass bomb from Mike’s Taurus pedals, and this encourages Trey to start elevating his tones higher up the fretboard to hit a breathtaking peak full of gorgeous views from the top. At 14:00 it seems we are going to commence a new groove, but this passage is short-lived and yields to a “Twist” that comes oozing up from the grime below. While I personally prefer that “Wolfman’s” push for a while longer, this “Twist” still delivers without any drop in strong jamming. It settles down to G mixolydian on the back of Page’s Wurlitzer and synth work, with Trey adding thick and heavy gain to elevate the entire jam. “Waves” is yet another strong peak; after the “on the wind and under water” lyric, the jam slowly fades into a longing call extending out to the open seas at 7:00, Fish keeps the playing going on his ride cymbal as Mike and Trey induce space, setting the stage for Page’s synths to infiltrate every fiber of our being in A mixolydian. Page tugs at tension by playing a D major, only to resolve it back to the A. Eventually an enormous wash of noise overtakes the scene, taking the listener to space on the back of multiple shimmer algorithms (Trey and Mike both have Eventide Spaces – I suspect both are responsible for this massive swirl of entry into the void) and Page’s dissonant synths play elevates the group chromatically as a melodic collective. “Miss You” offers a much-needed breather for us to contemplate the answer to the question of the meaning of life, the universe, and everything that the band has just presented to us; “Boogie On Reggae Woman” does some thick and heavy groove-based jamming on the back half, akin to the “How Many People Are You.” Just when it seems that the jam is starting to grow its sea legs, the band aborts and instead forces the red velvet gag with “Wading in the Velvet Sea.” “Sweet Jane” takes us home in the encore slot, a nice upbeat rocker to close and bookend the show with the Velvet Underground theme. The mix decisions for this part of “From The Tapers’ Section” vary somewhat from the ones I made for the last. Here, I begin with a Schoeps mk4v cardioid tape to provide a strong and even-keeled midrange, with a detailed and accurate soundstage. The mk4v has a fairly strident and forward treble, and I knew I would eventually fill in the bass with the mk22 tape and treble with the mk41v tape; so I cut all frequencies below ~75 Hz, and further drop the upper bass and lower midrange with a shelving filter while using a high shelf and very soft upper-midrange bell filter to ease off the treble. To account for this loss in treble, I use the mk41v supercardioid, cutting all bass so as to not have it fight the mk22 and boosting the treble to accentuate the top end of this recording; this provides detail and air in the room, particularly around Fish’s cymbals and the upper registers of Page’s piano. This treble boost also allows the midrange of the mk41v tape to reinforce without fighting the midrange of the mk4v. Finally, I take Noah’s Schoeps mk22 open cardioid recording and heavily low pass filter the signal, allowing through only the kick drum, fundamental tones of the bass guitar, and some room reflections. 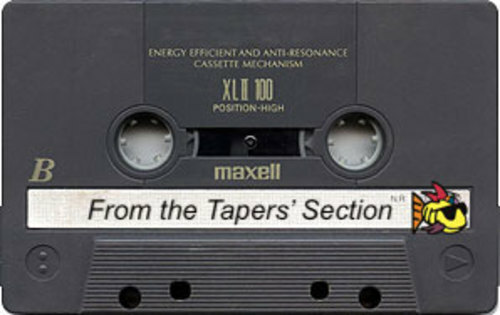 And finally, we have a wrap on Part 2 of “From The Tapers’ Section.” Hopefully I have given you some refreshing thoughts on the modern audience tape and a new way to hear some phenomenal music. Feel free to reach out to me with questions or comments, and in the meantime I leave you here to spin and get lost in the tapes! A quick note about the file sets for those of you grabbing these: a common technique used in production is audio compression. This reduces the dynamic range of a recording by making the loudest portions of the waveform quieter, and allows the overall volume to be raised without inducing clipping. One reason I love AUD tapes is that they preserve the details - the subtlety between quiet and loud - with pristine quality, and often remain uncompressed to give you the full dynamic range of the original performance. For the FLAC file sets, I did not touch this tape with any mastering compression; I wanted to preserve the detail and subtlety of every nuance of this tape. However, for the mp3 file set I have added some very mild studio compression techniques in order to raise the overall volume just a bit, expecting many of you to use the mp3 version on your phones, tablets, and other mobile devices where space is a premium and fidelity isn’t a luxury to be afforded. I recommend that you judge the mix on a decent sound system or pair of headphones you know well with the FLAC file sets, however the mp3 files should still sound quite good for your on-the-go cloud library with inexpensive earbuds. Love these write ups so much! Thanks again for all the hard work Wumbo! No joke when I say this: this 3 source matrix sounds WAY better than the LivePhish recording. WOW! Gave it a quick read through, but I want to go back and re-read it while listening to the show. I think there was a hint of the 2017 sound in a Mexico jam (DWD? Fuego?)... I need to go back and try and find it. Wow, great work, here! Can't wait to fire this up on the headphones when I can. The car stereo won't do justice to the care taken, here. Another great example of the passion and intelligence found in this community. I am thrilled that the summer tour is about to begin. Any idea which shows will be available to listen to live on the couch tour? I dropped the ball for summer shows but am going to Chicago in the fall.